**A long-lost English art-rock gem for fans of Flaming Tunes, Woo, or Cleaners From Venus. Gatefold jacket** "Blackest Ever Black presents to you Dead Unique, an album by Officer! recorded in 1995 but - outrageously, inexplicably - never before released into the public domain. This then is not a reissue or a revival; it’s a new record that just happens to have been maturing in the cask for, oh, a little shy of 20 years. 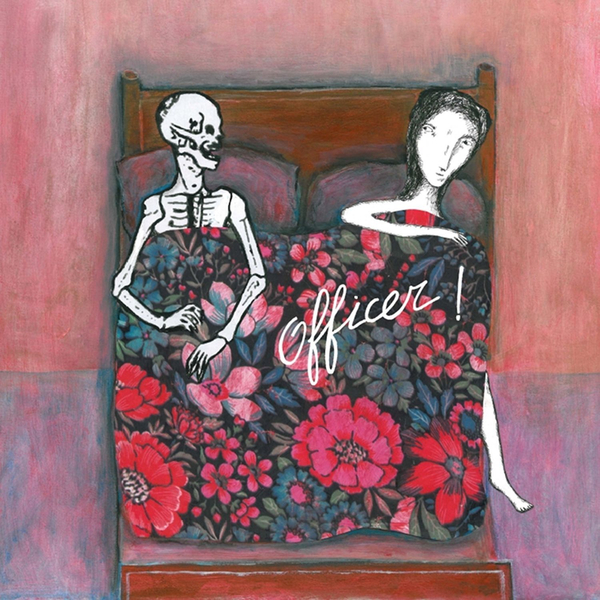 It also happens to be a lost classic of English art-rock, and the crowning achievement in the career of its mercurial creator, Mick Hobbs…Officer! – the project that this incorrigible collaborator and connector calls his own - surfaced in 1982 with a cassette tape entitled Eight New Songs By Mick Hobbs. It marked the blossoming of a singular writer and improvisor, with a gift for plangent melody, ingenious arrangement and lyrics at once caustic and courtly, playful and profound (two songs from this tape, ‘Life At The Water’s Edge’ and ‘Dogface’, have been remastered for a limited edition 7” release on Blackest Ever Black later this year)… A complex but thrillingly immediate avant-pop song cycle that charms and confounds at every turn, Dead Unique will give immense pleasure not only to Officer!’s existing cult following, but to anyone with an appreciation of piquant, idiosyncratic songcraft – fans of Kevin Ayers, Flaming Tunes, Art Bears, Woo, Dislocation Dance, R. Stevie Moore, Robert Wyatt, Cleaners From Venus, Lol Coxhill or The Monochrome Set should especially pay attention. It touches upon ragged-raw rock ‘n roll, sumptuous chamber music, pastoral folk, blowsy prog-jazz and paranoid dub-space, effortlessly shifting from skronking abstraction to rousing harmonic refrain and back again."